Posted by admin in activity reports, Chile, eruptions, Puyehue. Above: Puyehue-Cordón Caulle, 13 June 2011: image from camera number 2 at 20:50 GMT. Below: by 22:05 GMT the sky is darkening over the volcano and incandescence is visible at the bottom of the plume (OVDAS-SERNAGEOMIN). 1. It was possible to verify that the emission centre is located at the head of the course of the Nilahue river, immediately to the north of the fissure along which the eruption of 1960 took place, where abundant accumulation of volcanic ash was observed, particularly in the headwaters of the Contrafuerte river. 2. There was also a significant accumulation of ash towards the eastern sector of Cordón Caulle, particularly on the west flank of Puyehue volcano. 3. Significant quantities of floating pumice were observed on the surfaces of Maihue, Huishue, Gris and Puyehue lakes. 4. The south-western part of Cordón Caulle and the western slopes of the Cordillera Nevada do not appear to be affected by ashfall. The bulletin also notes that seismicity remains ‘largely unchanged’ from the previous report, although there was an explosion at 15:35 local time on 11 June that pushed the eruption column, usually around 4.0-4.5 km in height, up to 8 km altitude for a short time. Some of the areas to which access was previously restricted (Rucatayo, El Boquial, Lican and Mantilhue) have been opened up again, but SERNAGEOMIN continues to warn of the danger of lahars in areas affected by ashfall. … the seismic signal has been characterized by episodes of increase and decrease in the level of tremor, associated with an increase in the height of the eruption column, without significant registering of other types of earthquakes. There have been at least five cycles up to the time of publication of this report. The eruption column associated with the previous pulses of tremor reached heights of up to 8 km, with a very dense aspect, of dark grey colour, connected with ashfalls in surrounding areas due to partial collapses of the column. During the flight the eruption column showed significant variations in height. It was confirmed that the eruption has been forming a cone at the emission centre, the crater has a diameter of approximately 300-400 metres. The presence of fragments with a ballistic trajectory up to slightly more than 1 km from the emission centre was verified. There is no great amount of ash to the west of the emission centre, while there was a great accumulation of pyroclasts to the east and north-east of that centre, in the headwaters of the Nilahue and Contrafuerte rivers. During the occurrence of emissions of increased intensity, the lower part of the column collapsed. The release of water vapour and gases at two or three points located north-west of the same fracture where the emission centre is located was observed. The dangers of lahars and of the potential for the volcano to change its eruptive behaviour without warning are emphasized, and the alert level for Puyehue-Cordón Caulle remains at Red 6: ‘moderate eruption’. The Chilean Servicio Nacional de Geología y Minería (SERNAGEOMIN) has issued its latest bulletin on the activity at Puyehue-Cordón Caulle: Reporte Especial de Actividad Volcánica No 36, 11 June 2011 (the PDF has not been posted yet). Overall the eruption shows no sign of coming to an end: the key word in this bulletin, as the preceding ones, is ‘stability’, although SERNAGEOMIN emphasizes that the behaviour of the volcano may change and the intensity of the eruption increase at any time. There is continuing ashfall and a high risk of lahars. Seismic activity at Cordón Caulle ‘showed no major changes compared with yesterday’, with an average of 5 events per hour, with magnitudes not exceeding 2.3. The earthquakes have been located to the area SE of Cordón Caulle, the majority at depths of between 3 and 5 km. The ‘continuous signal of tremor’ observed since the beginning of the eruption is continuing in a stable manner, associated with degasification and the movement of material towards the surface. The eruption plume ‘has shown an oscillating pattern with respect to its altitude’, reaching a height of approximately 4.0-4.5 km in the morning of 11 June and trending towards the east. The plume has shown a ‘slightly whiter’ colouring than on previous days. The Nilahue river has shown decreased flow in comparison to 10 June, and is still brown in colour, carrying quantities of pyroclastic material. The alert level for Puyehue-Cordón Caulle remains Red 6, ‘moderate eruption’. 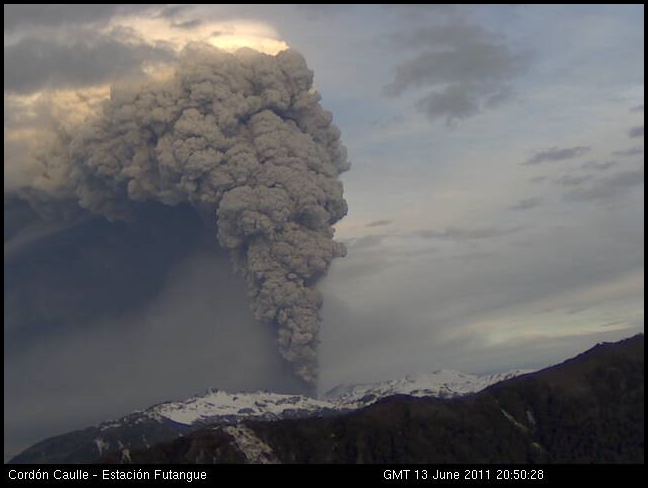 Posted by admin in activity reports, Chile, eruptions, Puyehue, volcano monitoring, volcano webcams. Chile’s OVDAS (Observatorio Volcanológico de los Andes del Sur) currently has three webcams monitoring Puyehue-Cordón Caulle. It’s great to have the cameras, but there are some reliability problems with them: their images freeze from time to time, and one of them fell into a box earlier today. It’s back out again now and just provided the view above (camera number 2): the east-trending plume looks vigorous and moderately ash-laden. OVDAS’s Puyehue-Cordón Caulle webcams: number 1, number 2, number 3. Volcanologist Jorge Clavero of the Pontificia Universidad Católica de Chile, interviewed on Terra.cl, warns that ‘the major danger associated with this type of eruption is not lava, but all the ashes that are falling, floods, or the formation of pyroclastic flows with glowing clouds’. Clavero also dismisses any question of a link between this eruption and the earthquake of February 2010: ‘We are talking about an eruptive event that is beginning nearly 15 months after this earthquake, therefore, the relationship of cause and effect is very difficult to prove. I would say sincerely that there is not direct cause’. El Mercurio has also been talking with volcanologists, and muses on the catastrophic consequences of an eruption column collapse or a major flank failure at Cordón Caulle. Meanwhile, the BBC reports that airports are re-opening in Uruguay and Argentina and some flights are resuming after two days of ash disruption. The image above comes from the European Space Agency, and shows the sulphur dioxide plume released by the eruption at the Puyehue-Cordón Caulle volcanic complex. The image was captured on 6 June 2011 by the Infrared Atmospheric Sounding Interferometer on Eumetsat’s MetOp-A satellite. The eruption continues at Puyehue-Cordón Caulle: the overall picture appears to be of a stable situation of continuing activity with a slight tendency to decline; within this overall picture there is slight variability in the intensity of the eruption. SERNAGEOMIN’s bulletins (accessible as PDFs here) generally report slight reductions in seismic activity from day to day, although the bulletin for 9 June (PDF, or online) reported a slight increase compared with the previous day. The most recent bulletin (10 June 2011: PDF, or online) reports a slight decline in seismic activity and a continuation of tremor associated with the process of degasification, also consistent with previous days. The eruption column is not currently visible because of poor weather conditions, but the bulletin gives its altitude as approximately 3.7 km, with the plume directed towards the SE, with prediction of continuing ashfall ‘towards the ESE’. Using satellite data, the bulletin also gives a location for the seat of the eruption: ‘New satellite images from the TerraSAR X satellite allow centre of emission of the eruption to be located more precisely. The location has been determined to be in the Los Baños area, at the headwaters of the río Nilahue, at co-ordinates 40.525º S, 72.142º W’. This puts the activity on the south flank of Puyehue-Cordón Caulle, about 7.5 km from the summit. The bulletin warns that ‘given the stability of the eruptive activity’ there is the likelihood of ‘continuing occurrence of waves of pyroclastic flows along the course of the Nilahue river, the waters of which may reach temperatures similar to those reported yesterday [45°]’, and that ‘the heavy rain occurring in the region, along with the great accumulation of pyroclastic material (ash, pumice, flows) in the headwaters of the watercourses which originate in the volcanic complex, favour the probability of the occurrence of secondary lahars generated by the blocking of the stream beds’. The accumulation of ash across a wide area to the SE of the volcano is expected to cause continuing problems of floods and lahars for as long as the eruption continues. The bulletin ends by stressing that despite the eruption’s tendency towards stability there remains the possibility of an upswing in activity, and thus that the alert level of Red 6 – Moderate Eruption is being maintained. The problems caused by the ash from Puyehue-Cordón Caulle have not gone away, and given the situation as reported by SERNAGEOMIN it looks as if they will be around for some time to come. Reports today say that the ash is now reaching as far as New Zealand and Australia, where flights are already being cancelled because of the presence of ash at 20-30,000 feet. In South America extensive flight disruptions continue, as the ash cloud reaches across Argentina to southern Brazil and Uruguay, The effects of the eruption on the flora and fauna of the region have been causing some concern, as have the economic impacts on the affected areas, notably Patagonia. The Chilean Army has been heavily involved in monitoring and relief operations in the area affected by the eruption: Radio Bío-Bío has a report and pictures. Approximately 4,000 people have so far been affected by evacuation orders in Chile; and where there are evacuations, there are always people who refuse to go. A court in southern Chile has granted the authorities powers to remove by force, if necessary, 14 (or possibly 18) people near the volcano who insist on staying in harm’s way. 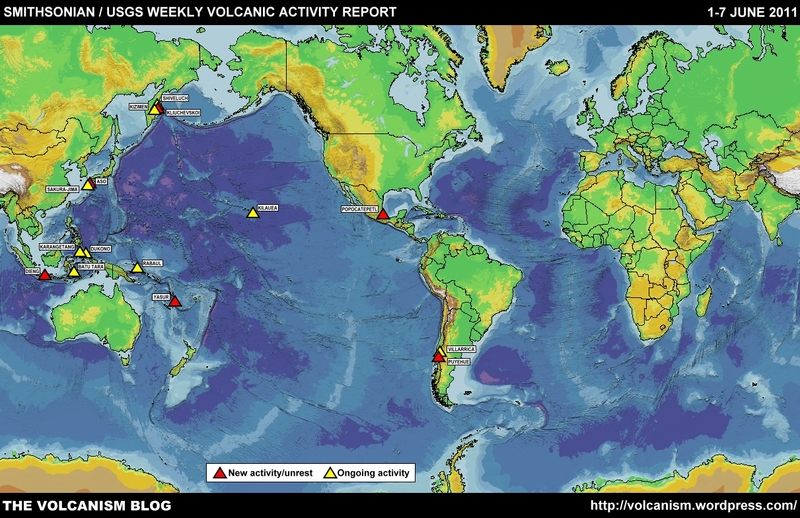 Posted by admin in Chile, eruptions, images, NASA Earth Observatory, Puyehue. The NASA Earth Observatory has been showcasing some stunning images of the current Puyehue-Cordón Caulle eruption in southern Chile (coverage here and at Eruptions). Reduced-size previews are given below: click on the image to go to NASA’s originals at the Earth Observatory site. Above: Puyehue-Cordón Caulle eruption, MODIS image from NASA’s Aqua satellite, 4 June 2011 (NASA). Above: Puyehue-Cordón Caulle eruption, MODIS image from NASA’s Terra satellite, 6 June 2011 (NASA). Above: Puyehue-Cordón Caulle eruption, GOES-East/MODIS image, 6 June 2011 (NASA). As always at the Earth Observatory, the images are accompanied by detailed and informative captions, with lots of links to reliable sources of further information and explanation. The eruption of Puyehue-Cordón Caulle in Chile is still ongoing, albeit with reduced energy, and is proving to be a very very ashy event indeed. The ash has now crossed the South American continent and is reaching Buenos Aires, Brazil and Paraguay, as Erik Klemetti notes in an informative update at Eruptions. Flights within South America and further afield have been extensively disrupted but some flights between Chile and Argentina are now gradually resuming. as the ash cloud shifts and begins to disperse. As its effects lessen in one area, however, it makes its presence felt in another: flights between Argentina and Bolivia and from southern parts of Brazil are now being affected. Back at the site of the eruption, SERNAGEOMIN personnel have been busy assessing the situation and the latest bulletin from the agency, issued at 09:00 local time on 6 June (PDF here), reports that ‘from 13:00 yesterday [5 June] to the time of publication of this bulletin a progressive decline has been observed in the seismic activity associated with Cordón Caulle’. The altitude of the eruption column is given as 10 km, with the plume reaching ‘an approximate length of 3,300 km, directed initially towards the northeast (300 km), then changing its direction towards the southeast-east’ (This dog-leg plume can clearly be seen in a MODIS image of 6 June from NASA’s Terra satellite, reproduced at the NASA Earth Observatory). SERNAGEOMIN observers reported five pyroclastic flows during the afternoon of 5 June generated by the partial collapse of the eruption column which may have travelled along the Nilahue river valley for a distance of approximately 10 km. Bad weather, however, has prevented any confirmation of the precise dimensions of the deposits produced by these flows, or of the presence of any lava. The flow of the Nilahue river was reported to have been reduced on that afternoon, leading to concern at the potential threat of lahars produced by the combination of ashfall and heavy rain. The SERNAGEOMIN bulletin concludes with a warning that lahars are ‘highly probable’ in the river valleys north of the volcano and may affect communities in those areas. The alert level for the volcano remains at Red 6, ‘moderate eruption’. The eruption at Puyehue-Cordón Caulle appears to be continuing, but with declining force. The Chilean geological service SERNAGEOMIN reports in a bulletin (PDF) released at 13:30 local time yesterday, 5 June 2011, that ‘since 18:00 local time yesterday [4 June] the eruption which began at Cordón Caulle has declined in intensity’, with diminished seismicity characterized by low-frequency tremor and a reduced number of hybrid earthquakes ‘associated principally with the fracture of rigid material and explosions located in the area to the SE of Cordón Caulle. An overflight on the morning of 5 June ‘reported an eruption column of 10-12 km altitude and 2 km width’. The most recent advisories from Buenos Aires VAAC confirm ‘continuous emission’ with the plume reaching FL350/400 (35,000-40,000 feet, 10.6-12.2 km altitude). The alert level remains at Red 6, ‘moderate eruption’. The state emergencies office ONEMI also released a bulletin yesterday which gives a summary of a news conference held by senior officials of the Interior Ministry, ONEMI and SERNAGEOMIN which highlighted the dangers posed by volcanic sediment in the river system around the volcano. A shift of the wind yesterday brought heavy ashfall to Lago Ranco, about 70 km north of the volcano, and the evacuation has been extended to that area. The Under-Secretary of the Interior warned that ”The zones of the upper and lower Riñinahue present a risk of floods produced by sediments that have been deposited’, while Enrique Valdivieso of SERNAGEOMIN reported that ‘through monitoring carried out both north and south of the [volcanic] range we have seen the presence of sediment and pumice in the southern sector’. The possibility of lahars is clearly of some concern at the moment. Valdivieso also said that lava had not been detected by SERNAGEOMIN, but pyroclastic flows had deposited sediment, mud and debris on the flanks which would descend the watercourses and reach surrounding districts during the morning of 6 June. Both SERNAGEOMIN and ONEMI are maintaining their related but slightly different Red Alerts for the Puyehue-Cordón Caulle area, and the evacuation orders remain in place. The ashfall from this eruption has had a significant impact on Argentina, with reports that over 200 square kilometres of Chubut Province has been affected and suggestions that the ash has now been detected in Buenos Aires. Meanwhile the change in wind direction has brought renewed wories for the Chilean authorities about ashfall and hazardous emissions affecting areas to the north of the volcano. FURTHER UPDATE: Erik Klemetti has a thorough and detailed update on events at Puyehue-Cordón Caulle at Eruptions. The Chilean Interior Ministry has extended the zone of evacuation imposed as a result of the eruption of Puyehue volcano, and up to 3,500 people are now affected. There are concerns about the capacity of the shelters provided for the evacuees, while many of those who have left their homes are worried about the fate of their properties and animals during their absence. A nearby crossing point on the Argentina/Chile border, at Cardenal Samoré pass, has been closed because of the eruption. Across the border Argentine territory has been affected by the eruption, with the town of Bariloche experiencing substantial ashfall this afternoon. NASA’s Aqua satellite took the image above not long after the eruption began: the very ashy character of the emissions is evident. This is a detail of the original image, at 1 pixel = 250m scale; click here or on the image to go to the original at the NASA Rapid Response System site. About the nature of the eruption itself there is still relatively little information. SERNAGEOMIN has issued no new bulletin since their brief announcement that the eruption had begun, press coverage is short on detail, and there are no webcams for this volcano. The event clearly developed very quickly, with the initial plume rapidly reaching 10 km altitude, according to the first advisoryissued by Buenos Aires VAAC (20110604/1930Z). Later advisories reported ash at FL390/400 (39,000-40,000 feet, 11.9-12.2 km altitude), moving ESE. Videos of the eruption showed a substantial grey-white plume, but the views were somewhat obscured by cloud. SERNAGEOMIN described the plume as having an approximate height of 10 km and width of 5 km, and also reached the rapid conclusion that the eruption was VEI=3. The alert level for Puyehue has been raised to Red 6, ‘moderate eruption’ (details of the Chilean volcanic alert system can be found in this PDF from SERNAGEOMIN). Posted by admin in Chile, eruptions, Puyehue, volcanoes. 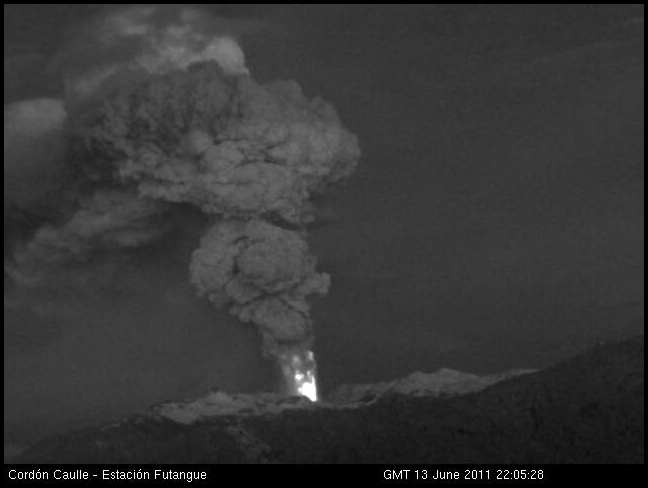 There are reports from Chile that Puyehue-Cordón Caulle has erupted and produced a large plume. ‘Just after 14:40’ reports soychile.cl, ‘a huge plume began to be visible from the district of Entre Lagos, which corresponds to the beginning of eruptive activity at Puyehue volcano’. The Los Ríos regional government has confirmed that the eruption has begun, with ‘a strong smell of sulphur and ashes’ being discernible in the area of the volcano. The state emergencies office ONEMI has also confirmed that an eruption is under way. Buenos Aires VAAC has issued a Volcanic Ash Advisory for the eruption reporting ash from the plume at 10 km altitude (FL350, 35,000 feet a.s.l.). The ash is moving south-east, into Argentina.